This year’s Fancy Food Show, which took place at the Jacob K. Javits Convention Center in Manhattan. Today, though, you can buy kale chips at CVS, choose from an array of kombucha flavors at any number of convenience stores, and take your pick of gluten-free delicacies. What was once a trend toward healthier, more mindful eating has become an ingrained lifestyle for countless Americans, and judging by this year’s Fancy Food Show, which took place at the Jacob K. Javits Convention Center in Manhattan earlier this month, those habits show no signs of fading away. 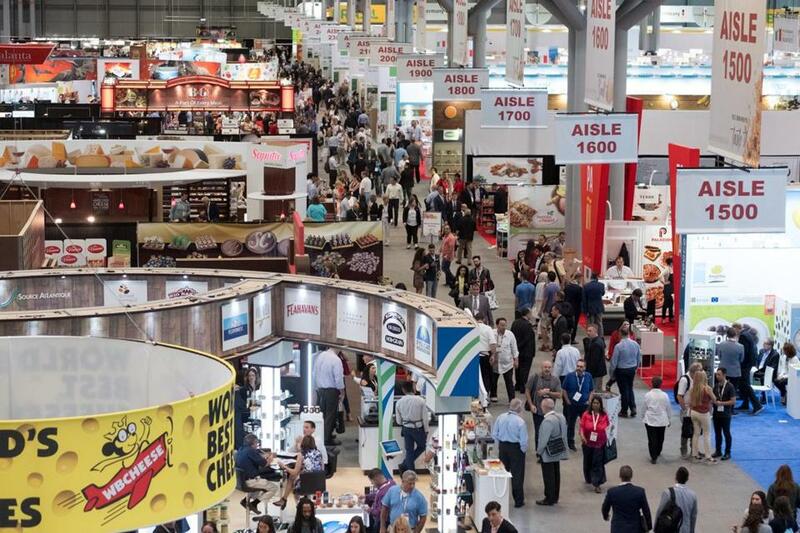 This year marked the 64th show, an event produced by the Specialty Food Association, a member-based trade organization. Nearly 2,400 companies showcase over 240,000 products across 365,000 square feet, the equivalent of about six football fields. The crowd of about 34,000, consisting largely of owners of and buyers for small food markets and chain grocery stores as well as restaurateurs, chefs, and distributors, all had the same mission: to make sure their inventories and ideas stay on trend. Today, in what might seem a counterintuitive development, “specialty” and “on-trend” are interchangeable. According to a study by Mintel, total specialty food sales in the United States bring in about $140.3 billion, up 11 percent since 2015. But first, about that word. “Specialty” might seem a bit vague, but Phil Kafarakis, president of the SFA, has a very clear definition. Specialty food companies are focused on several touchstones: purity and authenticity of ingredients, integrity of the process, and packaging. Also, social awareness and sustainability are huge factors. For anyone walking the floor, this trend-stalker among them, it is an exercise in pacing, staying hydrated, and staying organized. Over the course of two days, we were scanning packages emblazoned with terms like vegan, gluten-free, fair trade, probiotic, and superfood, from companies that have words like nature, natural, wild, fresh, healthy, raw, real, and naked in their names. I consumed butter by the spoonful (herbed, hand-churned butter from an Amish farm, that is, which makes it slightly more acceptable), partook in several comparative tastings of olive oil, including one with a product that toted fruit from a 500-year-old tree in Italy, and I was schooled in the variety of fruity, floral, woody, acidic, and nutty flavors that cacao lends to chocolate bars. I developed a new appreciation for tinned fish, and I sampled pink pepper quinoa crackers, chocolate-covered potato chips, vegetable sorbets, vegan jerky, gluten-free bread, and other snacks that once would have seemed like contradictions in terms. I drank fish broth, beef broth, all sorts of fresh-pressed liquids, and enough cold brew coffee to keep a family of four awake for an overnight drive, which was almost enough to keep me fueled for the entire day. There were plenty of traditional items, too, though often with some eccentric twist, like pastas made from chickpea flour and pretzels made from ground-up cauliflower. And I ate crickets, crushed and cooked. Daniel Novak, cofounder and CEO of Montreal-based Crickstart, won me over when he described them as “little land shrimp” and explained that 2 billion people in 80 countries eat insects as part of their diets. Who was I to contest the diets of 2 billion people? His organic chili-flavored crackers, for the record, are earthy and intensely crispy. Massachusetts is one of his first US regions to sell his bars and crackers. You can find them at Cambridge Naturals and online. The show floor is organized by countries and by eight American regions, Massachusetts being one of them. Chocolate and other sweets were heavily represented by the Bay State. Companies like Boxborough-based Two Friends showcased small batch chocolate bars in flavors like saffron and chili pepper; CB Stuffers from Swampscott unveiled its coaster-size, 1-inch-thick salted pretzel peanut butter cup; and Goodnow Farms in Sudbury, one of the few bean-to-bar chocolate makers on hand, presented its exquisite single-origin bars. Browsing through the items from 54 countries, it was clear that ghee, a versatile traditional Indian clarified butter, is on its way to becoming a common ingredient, cauliflower is the new kale, African flavors are the new darlings of the spices world, and imitation meat is the next meat. I spotted several that aren’t widely available yet, but absolutely worth keeping an eye out for, like truffle “perlage,” black truffle juice encapsulated in caviar-size spheres from Tartuf Langohe in Italy’s Piedmont region; Juusto, a halloumi-like baked cheese, a traditional Scandinavian delicacy, made in Wisconsin; and popped, crunchy tofu (think: protein meringue) from Korea. Perhaps the most exciting part, though, was the abundance of startups that got their own sprawling showcase space in “Incubator Village” which, in years past, had been merely “Incubator Alley.” Jen Faigel, cofounder and executive director of CommonWealth Kitchen, an incubator in Dorchester that was established in 2009, was there with eight startups, including Bauman’s Best Botanicals, which makes shrubs or flavored vinegar; Farmhouse Burger Company, whose veggie burgers are fortified with organic pearled barley; Five Way Foods, which makes fish and beef broths; and Sweet Teez Bakery, a Jamaican rum cake company founded by Dorchester native Teresa Thompson Maynard as a result of her pursuit of allergen-free snacks for her family. They’re a small fraction of the 50 member companies at CommonWealth, which is also a manufacturing facility. It’s a $2.5 million per year operation, having grown 700 percent from 2014 to now. Liza Weisstuch can be reached at liza.weisstuch@gmail.com. Follow her on Twitter and Instagram @livingtheproof.